Great to deal with you. replaced the stock battery on my jeep wrangler jk with this battery.the original optima lasted 11 years. hopefully this does the same. Brilliant product I bought 4 of these to use in pairs on two different diesel locomotives and they work a treat with no trouble starting the two leyland bus engines on each vehicle so if that doesn’t prove how good they are I don’t know what will Top batteries ?? I purchased this for my grand voyager mk v , although an expensive buy I can't fault I at moment working great , The service I got from tayna batteries was absolutely brilliant purchased at 3.30 pm and delivered before 12.30 pm next day . PS WOULD recommend and use them again. We ordered this battery for a Jeep Wrangler Unlimited 2.8 CRD which is an exact replacement for the original which failed after 8 years! The service we received from Tanya batteries was outstanding delivered as stated the next day and extremely well packed the price for next day delivery was a bargain considering the battery weighs nearly 60 pounds! however getting it into the Jeep was an interesting experience because of its weight! there is also extremely useful information on the Tanya website - (maybe need one on weight lifting!!) highly recommended company - thanks! Exactly as pictured and delivered quickly, powerful battery but heavier than most other batteries but also better than most. Battery fit was spot on, Jeep now back in business and this was the most competitive price online. Arrived next day with good delivery updates all the way in. Great Battery for my Chrysler Grand Voyager Mk5 “does what it says on the tin” would recommend. Would also recommend Tayna Ltd - excellent Customer Services and speedy delivery. Brilliant battery and five star prompt service unbelievable quick delivery. Keep it up. I have not had the battery long enough to assess it properly. However, based on the time since delivery, it is performing well. 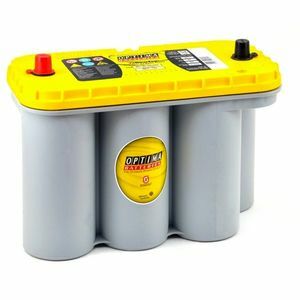 This is an awsum battery,it is a little taller than a standard battery but has a lot of power, perfect for my defender when starting and winching. Well packed , exact to the description .